If you need to cancel your booking, please e-mail or phone 14 days prior to your arrival date. There is a £5 administration charge. We are located seven miles east of Maidstone, Junction 8 of the M20 motorway just 1 hour from London, 30 minutes from the Channel Tunnel and Channel Ports. Dartford River Crossing is 30 minutes. Visitors never forget their first breathtaking vision of Leeds Castle in Kent, rising majestically from the moat as it has done for over 900 years. With 500 acres of beautiful parkland and formal gardens, daily activities, free flying falconry displays, special events and year-round attractions, Leeds Castle is one of the best days out in Kent. You will want to come back time and again! Leeds Castle offers families and couples the chance to escape to the countryside for a glamorous camping holiday with a difference. 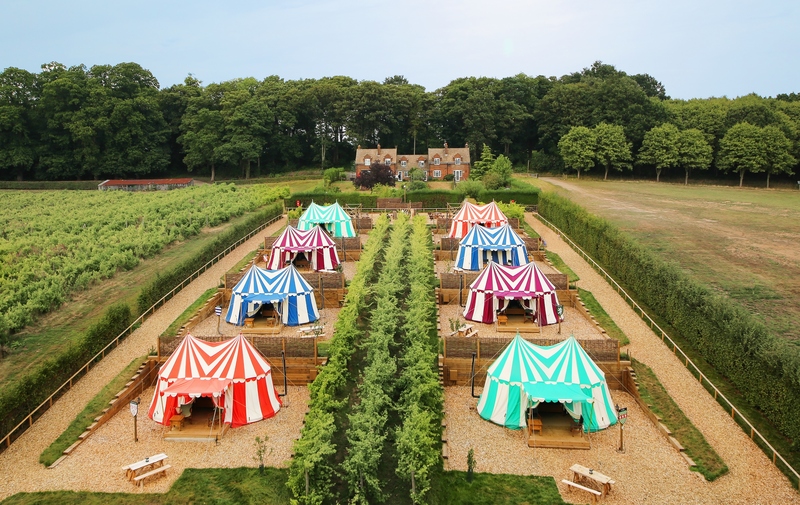 Eight splendid striped pavilions based on a Medieval design, form a "village" on the one-acre castle vineyard. For those wishing to experience lazy summer evenings outdoors and eat as medieval knights would have done before battle, use of the cast iron griddle over an open fire pit is included in your stay. A short stroll from the campsite, up the garden path to nearby Knight's Cottage, guests are provided with the use of new shower and washing facilities. Things to bring: cool box and ice packs, food and condiments, pots and pans for boiling or frying, wellie boots or sensible walking shoes, umbrellas, sun cream, chargers for your electrical items (mobiles, etc. ), charcoal and firelighters for the BBQ and wood-burning stoves. There are fire pits with griddles and BBQs provided, and that’s where cooking is done. Of course you can take your food back to the dining area in front of your tent, if you wish. They can provide extra beds, sleeping bags, pillow and blankets for children under the age of 17. There is a surcharge of £20 per child, per night.